Do you have Tasmanian ancestry? Government Gazettes in general contain a vast amount of historical and genealogical information. However they are largely an untapped resource. The few complete runs that are available are usually only found in major libraries. Even for researchers who do have access, the sheer size and extent of the Gazettes is daunting. Tens of thousands of ordinary people and localities, small and large, are mentioned every year in Government Gazettes Hoever, they offer researchers much more than simply names and places. They will help you reconstruct events and circumstances in the life of individuals and communities. 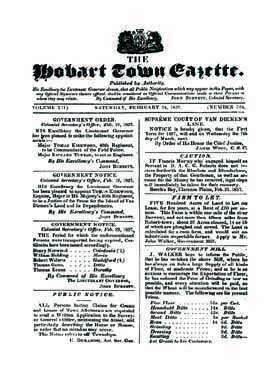 Unique to the Hobart Gazette is an immense wealth of information specific to the convicts that were sent to Tasmania. You will find: Wanted and Reward notices for many who absconded, including physical descriptions of the person; hundreds of listings of convict marriages; as well as listings of convicts together with the ship they arrived on, and the date they are due to receive their 'Certificate of Freedom'. Government gazettes were the vehicle for official government notices, and were normally issued weekly. Wthin these records you will find are thousands of ordinary people and localities, small and large. The information is too varied to describe in full, but following are some examples of what is in included. "What information can I find in these records?" Colonial Secretary's Office, Nov. 14, 1827His Excellency The Lieutenant Governor has been 'pleased to grant the following Indulgence:- Ticket of Leave to Daniel Hall, 349 Malabar.THE Ticket of Leave to Benjamin Smith, 519. Competitor notified in The Hobart-town Gazette of the 3d instant, is annulled, he having been recently sentenced to the chain gang, at New. Norfolk, for improper conduct.